Knowledge, Quality, Service, Integrity. These are the hallmarks MICHAEL GOLDSTEIN has embodied for more than 45 years as the owner and President of Cadillac Machinery Co., Inc. Michael, with his father Harold before him, was responsible for the worldwide reputation of Cadillac Machinery Co., Inc. as a supplier of first-class quality reconditioned machines and his extensive knowledge of the machines and the gear manufacturing processes. We provide plant, department and machine liquidation, auction, appraisal or valuation services. 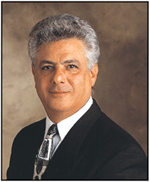 Michael Goldstein, a third generation machine tool dealer, has been known, worldwide, as a supplier of the highest quality gear manufacturing & testing machinery, gear tooling and accessories., and is perhaps best known as the President of Cadillac Machinery Co., Inc.
We offer gear hobbers, gear shapers, gear shavers, straight and spiral bevel gear generators, gear grinders, hob and gear cutter sharpeners, gear testing machines and gear instruments, as well as index plates, cutter bodies, change gears, cams, and many other gear tools and accessories. As you'll see in Michael's biography, he's not only an honored merchant, but has been a major contributor to the gear industry. He is a member of the American Gear Manufacturers Association (AGMA) since 1987, also a member of Machinery Dealers National Association (MDNA) since 1964, as well as the European Association of Machine Tool Merchants (EAMTM) since 1975. You can count on GOLDSTEIN GEAR MACHINERY LLC to knowledgably solve your gear manufacturing problem and sell you what you need, not only what we have for sale. Call us with your requirements or your surplus gear machinery, tooling or equipment. Copyright (c) 2009 Goldstein Gear Machinery LLC. All rights reserved.